So anyway, I tried a Peach Pie Ice Cream Recipe that I was going to share with you but I decided against it. Here's why: I've made a lot of ice creams and am getting pretty good at it, not to toot my own horn. But every time I make peach ice cream it's bland and hard and icy. Also, I love ice cream and I love peaches. Perfect marriage, right? Wrong! To me when things are so good on their own, sometimes one just has to leave them as is. But that's just me and my justification of my failed peach ice cream attempts. I was lazy one day and bought a three pack of ready-made pie crusts. All the packages had two nice crusts and one crumbled one, and I needed the pie crust, so I bought them. Hating the wasted food, I baked the broken crust, crumbled it, froze it, and saved it for my peach ice cream. Even though the peach didn't turn out well I did learn that no matter what, pie crust in ice cream is yummy. 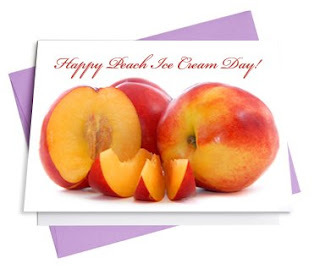 Happy Peach Ice Cream Day! For me, I'll celebrate with a ripe peach at some point, and a bowl of ice cream at another. Peach photo courtesy of Topfer at stock.xchng. Had to delay my National Peach Ice Cream Day celebration until today; I'm making both peach ice cream and chocolate ice cream with a 63% cacao chocolate tonight!